I’m actually unemployed for the next four days. I haven’t been out of work since moving to NYC so I’m kind of in shock at this. This isn’t like taking a vacation because I literally cannot work. Merkle has cut off my IT access so I can no longer work on anything for them. I have not yet started at OMD. There is literally nothing for me to do in terms of actual paying work. I cannot work, so I have the extreme luxury of spending my week engaged in my own personal projects and self-development. Which, today, means a Cave Day. This is enforced focus time, in which phones are confiscated and participants are encouraged to work on singular projects to encourage “deep work”. I chose instead to work on my backlog of email and Scout related tasks, which doesn’t quiet my monkey mind, but does make me feel like I’m making headway on my always overflowing inbox. Despite not having sunk completely into the “flow state” that often soothes my brain, I was able to action, reply, and file over a hundred emails in a couple hours and identify new projects and opportunities to be of service to the community in the process. Feeling like I am supporting my people, my community, is valuable, even if I’m doing it one small task at a time. For this afternoon, I’ve chosen to write blog posts for the sheer experience of being back in a “flow state”. This means that this isn’t going to be a terribly entertaining post. (Although, really, have my posts been that entertaining since I stopped chronicling the Adventures of Being In My Mid-20s In Los Angeles? PROBABLY NOT.) It is, however, a chance for me to get my own thoughts under control and to assess my priorities in a slightly more public forum. When I’m not working an actual paying job, what is it that I choose to do and why? And what long term effects do I hope to get from only four days of such chosen activities? The inverse of flow state is what I have most recently heard referred to as acedia, a state of despair resulting from apathy and a disregard for life. This term was originally coined to refer to monks who did not pray sufficiently, a condition that later became a sub-category of sloth. I tend to think of it as inertia, an inability to move forward or to regain the energy for life that keeps me in perpetual motion. The cause, however, seems to be ultimately a lack of flow state activity. A brain without flow state activity, be it a monk unable to focus on meditation or prayer, or a secular individual not engaging in deep work, seems to be a disconcerted and unbalanced brain. Add to this our American Puritan notion of work & the value we place on ourselves as related to our accomplishments, and you have a tremendous recipe for mental illness from both shame and misery. To combat some of this, I’m focusing more on activities that bring my brain into a flow state. Blogging is one of those; I spend an average of an hour on a blog post, from concept to writing to editing. I drop into a flow state sometimes when I’m sketching out concepts for work, drawing out slides for a presentation. Give me headphones and Excel and I’ll drop into flow state while I tease out data for the story of a presentation. I can spend a half hour drifting along on the piano, noodling on scraps of pop songs. And when I’m biking in traffic, with my whole brain occupied with movement and not dying, I’m really in a flow state. Still, writing is the best and most reliable way to enter that brain state, so I am trying to change how I look at it. Instead of writing for fun as being what I do when I have finished my other work, I am trying to look at it as what I do to train my brain back into being able to do deep work. Ultimately, by doing so, I’ll also quell my monkey mind, capture a state of deep work and satisfaction, and make my brain a little calmer and happier. I also want my brain to be practiced in how to do deep work as I transition to a new job. The value of a knowledge worker like myself is in her ability to do work that no one else can do. That is deep work, the work I pull out of myself, the observations I create and act on, the goals and vision I work towards. I will be looked to for my ability to deliver unique work, and only by really focusing and delving deep into my brain will I be able to do so. I have to practice putting my brain in that state so I can deliver on that promise to my new team, my new agency, my new clients. Whether it is the distraction-free peer-pressure focus of a Cave Day, or an hour spent framing up a blog post, I must work my brain just like I work my quads and hamstrings in a spin class until I can beat my own time over the Brooklyn Bridge. It is with the end in mind, or rather my mind in mind, that I therefore planned out my “week” of unemployment. I could have spent a month doing this, easily, and I actually considered taking more time off to do so. However, I also have to have healthcare benefits for my little family, so four days it is, and I’ll be grateful for the time I do have. With that said, I’ve chosen to spend today trying more to monotask, at a morning Cave and then spending the afternoon in the same physical space, albeit without the facilitator (meaning I get to keep my phone). After this, I’ll go to the gym, lift some weights, do a spin class to stay in my bike commute shape, and then go to a GTD meetup so I can revisit my productivity ninja skills before going to a new job. The rest of the week, I’ve opted to alternate productivity practice with “staycation”. I plan to spend Tuesday at the spa on 57th, getting a good old fashioned Korean skin scrub to fix my itchy, itchy winter skin and then I intend to loiter extensively in their hot tubs and saunas for the day before going to meet friends for drinks. Wednesday, I have another morning Cave, followed by the (sigh) next stage of my right side dental implant and then I’ll be home to celebrate my husband’s birthday for the one hour between when he gets home and when he has a co-op shift. Thursday, I have no agenda, and I may choose to spend at least part of the day at one of the museums (the Morgan, the Met Bruer) that I really would have liked to have gone to by now . I’ll also prioritize re-establishing some of the habits I fell out of while in my own state of acedia the last few months that benefit my mental health so much, such as my love of intense cardio (spin classes! ), and my piano practice. Four days isn’t anywhere near enough to engage in the kind of re-development, habit building and brain-training I’d like to be able to engage in but it is something. It’s like four days of gifts in a row, the free time and ability to refocus my energy on something that isn’t agency work, a license to engage my brain on projects that are easier to launch myself into and stay engaged in. Of course I will obsessively plan the time five times over and realized I still won’t have time for everything I wanted to do, but that’s also okay. It’s four days of learning and focus. It’s four days where my only job is to not have a job. 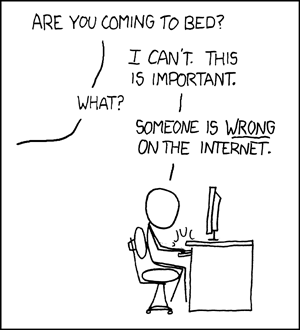 I am in the throes of #2 of a shameover from arguing on the Internet. It isn’t the argument itself I’m ashamed of, but the sheer waste of time it represents. It’s time I could be spending with my family, or time I could be practicing the piano, or time I could be doing my writing class homework. It’s time I could use to clear out my work inbox or finish up some Scouting responsibilities (as District Commissioner and acting GSM for one group, the Scouting never stops) or just return personal emails. There’s a dozen ways I could productively use time. Arguing on the Internet is not one of them. Therefore, after two hours of generally wasted time arguing over the child migrant separation crisis, I have a shameover. And it feels awful. I feel like I do when I over-indulge in other ways. I feel like I do when I carb binge, when my blood sugar spikes and I know it will eventually crash as well. I feel like I do when I watch waste of time TV. I feel like I do when I spend too much money, on impulse, on an item I do not particularly need and cannot return. I feel like I do when I drink two glasses of wine too fast and know it will mess up my sleep. I feel like I did last week when I trolled Trump supporters on the street. I feel like have cost myself something I cannot get back: in this case, time, energy, and a whole lot of adrenaline. I consider it a waste of time to argue online, because no argument online can be won anymore. No one’s mind can be changed anymore. No one wants to acknowledge logical points or even facts in an age when everything can be dismissed as “fake news”. There was once a day when people would engage in civil, well thought out discourse on bulletin boards; now we all wallow in fallacies of online arguing. There is no winning an argument or changing anyone’s mind online anymore; there is only being better at arguing and feeling better about being right. The only saving grace of arguing online is that there are some cases where I learn something new. Which I did, actually, tonight, from the original post that sparked the entire argument, which was moderately educational! This Medium post similarly argues that arguing is a positive in that it helps one “bulletproof” one’s arguments. Unfortunately, it’s almost always at a disproportionate amount of time and energy investment to argue for that knowledge. Often, the knowledge I get from arguing online is information could have acquired elsewhere without paying such a high price in time, energy and effort, without arguing, without getting my blood pressure and my adrenaline up. If I go poke around outside my own liberal bubble, I am pretty sure I can hear others’ points of view without having to waste time being polite and logical to random people I don’t even know who jump in the middle of an argument and decide to engage via deflecting and whataboutism. TRUE. Because one person’s “FIRST HAND EXPERIENCE” is totally representative of thousands of other experiences and makes them an expert in the subject! Why then, do I continue to waste time arguing online? It inevitably results in me losing sleep, not over the argument itself, but over the guilt of the waste of time and energy from it (not to mention the adrenaline coursing through my veins from any argument). I think it’s because there are two factors of appeal to online arguing for me: the need to hold people accountable for the social injustices they are supporting or failing to fight, and the need to be right. On the one hand, I have always wanted to crusade for justice and against what I see as wrong, so having the entire Internet in which to do so is great for arguing for what I see as morally correct. On the other hand, I just really like being smarter than everyone else and I will totally admit that. Arguing online may hold a thin veneer of justification in that it allows one to try to use rhetoric to convince someone to do good. Perhaps one will have the opportunity to impart knowledge and understanding to someone else. Perhaps one will learn some critical piece of information or insight into the logic of the argument. Perhaps one will learn a new way of looking at something, a new perspective that helps one understand the initial discussion topic better. In some cases, when people share their perspectives with me, I’m actually grateful for the insight and knowledge. However, ultimately, the knowledge that one cannot win an argument on the Internet means that if one is arguing, one is very likely arguing wholly due to ego. It then requires a degree of mindfulness to recognize one’s ego as a primary motivator so one can pledge that one will not argue on the goddamn Internet and then have to write an entire blog post on why doing so is a bad idea before one can peacefully fall asleep. Now, 900 words later, I feel like I’ve acquired some of that mindfulness – and I can go to bed. Goodnight world! Tomorrow is another day of being nicer on the Internet.